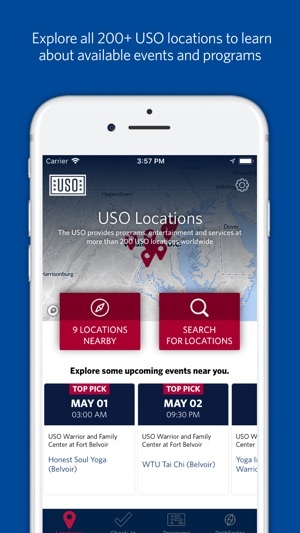 The USO app gives service members and their families the ability to find USO locations, discover USO programs, and quickly check-in on arrival at participating USOs. 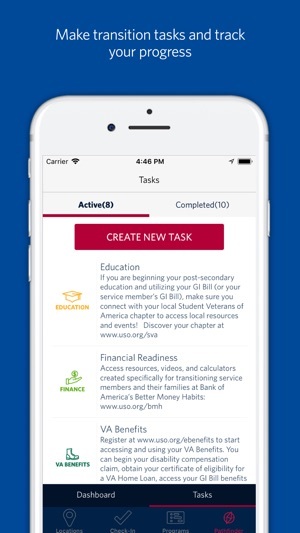 Please use the In-App feedback to let us know your thoughts on the app. We understand that not everything will be perfect as this is the first version of the app, please help us improve your experience! • Verify your account via SMS! Not only can you skip the line by using the app, the app defaults to my last logistical situation (traveling solo). So much quicker than the in-person check. I was skeptical of another app but gave it a go on a holiday travel weekend and it quickly proves itself. UPDATE: There’s an issue as of 2 Dec 2018. It won’t let me check in. I tried in Charlotte on 2 & 5 Dec and in Valparaiso, FL on 5 Dec. I deleted and tried to reinstall the app. App Store says app not available in this region. I’m in the US. I am updating this review to bring attention to the issue since my email earlier his week has has no impact. Please fix this issue before the holiday season really gets going and lines are long. Thanks for the review and feedback Kate. 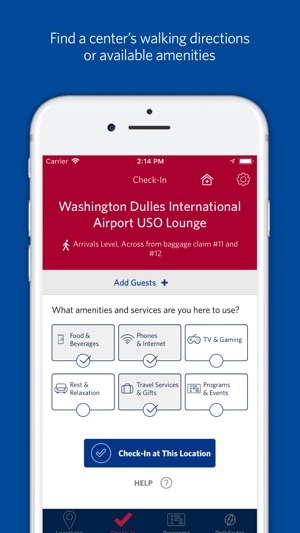 We are glad to hear that the app is helping to improve your experience with USO. 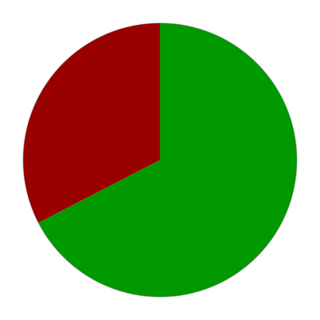 Stay tuned to updates as we have lots of plans for next year to add more useful features for you. 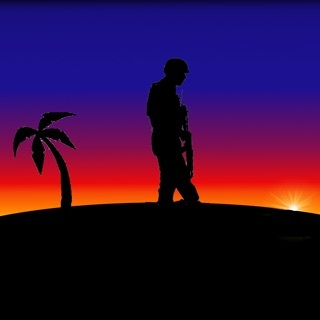 And thank you for your service to your country! 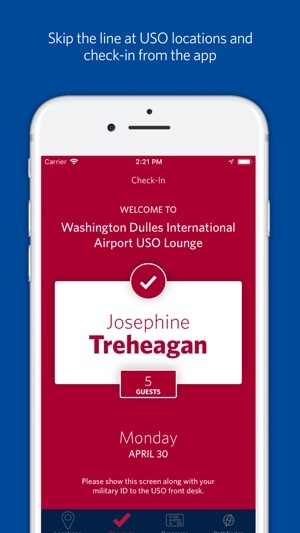 The app is a great way to locate a USO near you and if you wait long enough and are basically at the door it will actually allow you to check in. But there is the rub. If you are more than a few feet away (literally) and try to check in the app gives you an error message stating you are too far away. When you are rushing through an airport and the USO is only 100 yards away getting this error is frustrating and makes it significantly less useful. Please fix this issue and expand the range at which you can check in...then you get 5 stars! The first version 3 was unable to check me in. Wrote to customer support and never got a response. Reported it with others to local USO. They came back and said that they wetter told to tell us to delete and reinstall. Did so because I saw the second version of three. Now I had to go into the sign in process all over again. Okay. 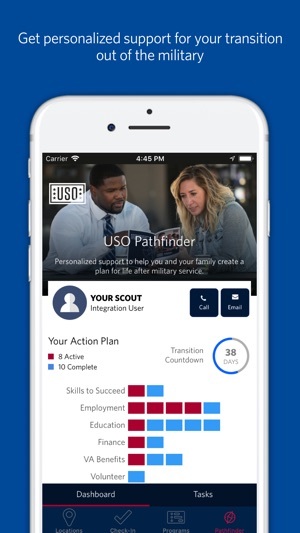 Sitting outside the USO using their WI FI I get the response from the App store that the App is currently not available in your city or region. PLEASE make version 2 available.